The U.S. 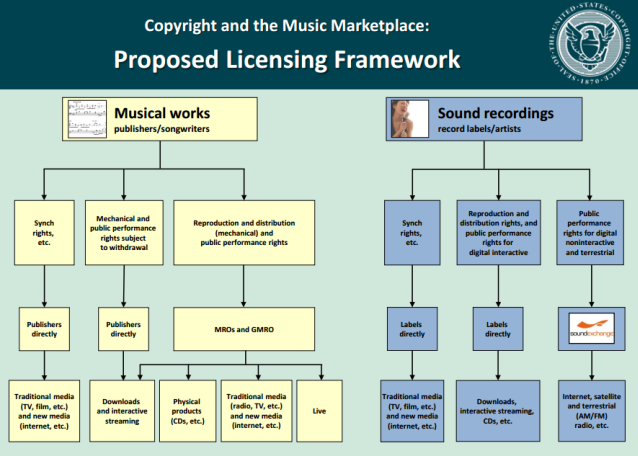 Copyright Office, which has recommendation power but no direct policy-changing power, released a comprehensive critique of how music licensing works in the U.S. Criticism, by itself, is not noteworthy during the current runup to the 2016-2020 royalty-rate period now under debate by all stakeholders. The document is exceptional for its detail, pedigree, and disruptive recommendations. Most controversial among those recommendations is a call for AM/FM radio to pay performance royalties to artists and labels for use of their recordings. Broadcast radio has always been exempt from that royalty, which is paid by satellite radio and Internet radio. Traditional radio stations must pay for the recordings they use in webcast streams, but not in over-the-air broadcast. When charting its recommended royalty payment structure, the Copyright Office simply labeled AM/FM radio as a non-interactive service, the legal designation of online listening platforms like Pandora, which pay statutory rates to labels and artists. (See chart below.) Advocates of this approach say that there is little difference between broadcast and streaming, insofar as both provide listening that cannot be fully customized (hence non-interactive). Opponents of this thinking regard radio as historically special in its role as promoter of music, and music sales. The report’s main power lies in driving awareness and conversation. One issue it addresses — lack of copyright protection for music produced before 1972, when the current Copyright Act started, has been getting plenty of activity recently, with oldies musicians initiating class-action lawsuits in state courts. Even the targets of those lawsuits, Pandora and SiriusXM, have stated publicly that federalization of pre-1972 copyright is a good idea. The Copyright Office agrees. The released document, which is 245 pages long (PDF here) is functioning like a boulder tossed into an already boiling lake, as audio publishers (traditional and new forms of radio) battle fiercely with music rights-holders (labels, performers, composers, publishers) over how to shake out the regulations for 2016 and beyond. the checks and balances of law push everything toward the center, tending to favor status quo, especially on issues with huge impact such as establishing new music costs for the U.S. broadcast radio industry. Another benefit of the Copyright Office’s work is the educational value of the report. Anyone who is a little shaky on how music copyright and licensing works in the U.S. would do well by this report as a textbook. I don’t see this as a “bombshell” with respect to the broadcast performance royalty. The Copyright Office has made no secret of their position on the performance royalty in the past, and this simply restates the position that they have had for many years. Some of the other proposals are new and will be controversial, while others are suggestions that may actually move the ball forward on a simpler, more straightforward music licensing system. The only section of the report that addresses the concerns of small (non-interactive) broadcasters like us, doesn’t offer much in the hope for relief from high royalty rates. Maybe SoundExchange thinks statuary licensing is working, but I fail to see that in everyday practice.